Finally leaving the lonely service roads in the southern Nevada desert, the A2B Route turned onto the Hoover Dam Access Road. Because of the mountainous terrain, the road snakes around as you approach the dam. 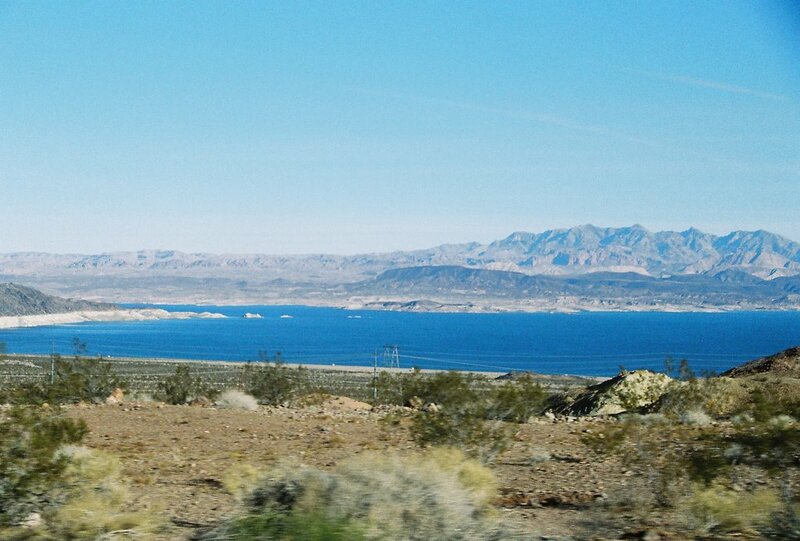 At one high point, you can see Lake Mead to the north. Before completing today’s leg, I passed through a security control point where all traffic crossing the dam is checked. First run back after being down with a cold. Though still a little weak, my body felt eager as I stretched. The morning was a cool 49 degrees as I stepped outside. Following the 20 Degree Rule, I started my run in just shorts and a t-shirt. The first few minutes of the run were cold! Remnants of the sickness had me coughing a bit. Before long, however, my internal temperature increased. I was comfortable and breathing clearly. Very cool! Even though this was an easy, short run, it felt great to be running again. I can’t wait to get back out again tomorrow! While stretching, I came across one of my favorite tweets from Anthony Famiglietti (@recklessrunning). I have been thinking about this, off and on, for some time now. As I started my run, I remembered something that a friend of mine once told me. She went to a highly recommended professional trainer to help prepare for a big marathon. Before doing anything, the trainer ran a battery of tests, including vo2 and measuring body type. The trainer then announced the best possible time that she could run a marathon, based upon all of the results. I remember that I cringed when she told me this. I wondered if the trainer had just limited her running potential with science. I then thought about Roger Bannister, the first person to run a sub-4-minute mile. For more than ten years, the world record for a 1 mile run stayed fixed at 4:01.4. The respected physiologists of the day taught that the human body was not capable of running a 4-minute mile. It was a matter of physics. The human body simply could not drive itself over a mile in 4-minutes. At some point, Roger Bannister rejected learned wisdom. On May 6, 1954, he ran 1 mile in 3:59.4. With that, he effectively removed the mental barriers that had limited runners and other athletes. Interestingly, Roger Bannister held the world record for only a few weeks. Understanding that it could be done, John Landy ran a 3:58 only six weeks later. Next, I thought about my brother, Tom. In 1984, he was coming off of a running injury that had kept him grounded for some time. As he returned to training, he set his sights on a full marathon. This would be his first. Tom was not one to want to just “run” a marathon. Rather his desire was to “race” the marathon. While he trained and prepared for the race, colleagues and coaches counseled him that a marathon was too lofty a goal after an injury. They strongly encouraged alternative, lesser goals. Persistent, Tom kept his eye on his goal. In the end, Tom not only won that marathon, but he set the course record at 2:27:31 (average pace 5:38/mile). That record still stands today. In terms of my own self, I am now running faster than I ever have in my adult life. And now, I am close to setting a lifetime PR in the half marathon. As for shorter distances, surpassing my best time as a teenager in the 1-mile run is within range. All that is needed is a few months of consistent speed work. I do know what I want to achieve. My ultimate running goals are very aggressive. But as daunting as they might be, I am absolutely certain that they are within my ability. I am equally certain that my friend’s professional trainer would take one look at this 47 year old man (who needs to lose another 10-15 lbs.) and suggest otherwise. As I consider all of this, I think about the time and distance that I want to set as my next incremental goal. How big of a leap forward do I want to make? And what is the price to get there? Finally, I decide and commit. As I finished today’s run, I quietly thank Mr. Famiglietti with his heretical advice to resist limits and press forward!